One hundred bolts of lightning strike the earth every second. Each bolt has two or more electrical flashes moving quicker than the eye can see. In Lightning, find out about the powerful forces inside a thundercloud, how lightning forms, and what happens when it strikes. You’ll see amazing close-up photographs of lightning, and you’ll learn some safety tips for the next time a storm comes up. 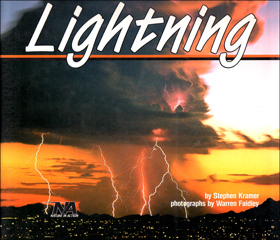 Science writer Stephen Kramer and award-winning photographer Warren Faidley present an engaging text and dramatic photographs for a fascinating look at the natural phenomenon of lightning.